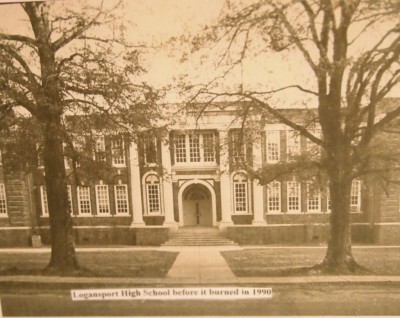 Logansport was founded in 1830 by a Dr. Logan who practiced medicine in Louisiana and Texas. He established a ferry on the Sabine River which was known as Logan’s Ferry. The name Logansport was given the town when a post office was established February 28, l848. Samuel Mather was the first postmaster, serving until Oct. 1850. The post office has been in constant operation since its establishment with the exception of a short time after the Civil War. 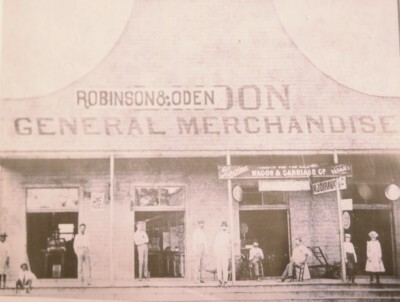 It was re-established in Oct. of 1866. There were few people living in the town prior to the arrival of the railroad. In 1885, the H.E. & W.T. Railroad from Houston, Texas, reached the west bank of the Sabine River, while the Houston & Shreveport Railroad from Shreveport, LA reached the East bank. It was a year or two later before the bridge was completed over the river. Both railroads were “narrow gauge” but were changed to standard gauge in 1894. The first election was held on June 25, 1887. In this election there were only 15 qualified voters listed. Elijah Price was elected Mayor along with the following 5 trustees: A. H. Odom, H. N. Mize, A. M. Garrett, S. Kemp, and W. J. Hicks. The second election was held June 24, 1889, when the total vote cast was 23 and W.C. Hardy was elected Mayor. Later the term of office was changed to four years, and the name “Trustee” was changed to “Alderman.” As soon as the railroad opened for business, the cotton wagons and others en-route to Shreveport from East Texas found it no longer necessary to make the long trip via dirt road. Several cotton buyers had located here and the farmer could sell his cotton to the street buyer who bid the highest. A.J. & W.I. Ingersoll of Shreveport were the largest buyers and for a number of years maintained offices here. 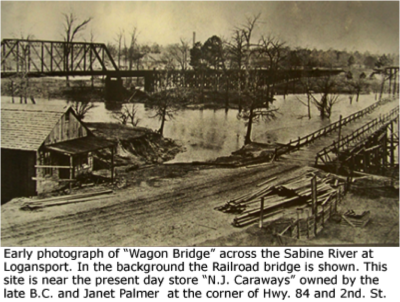 The ferry continued to operate across the Sabine until some time in 1898 when a “wagon” bridge was built to span the river just above the ferry road which was at the foot of Main Street. This bridge was destroyed by fire and was replaced by the present Highway bridge. 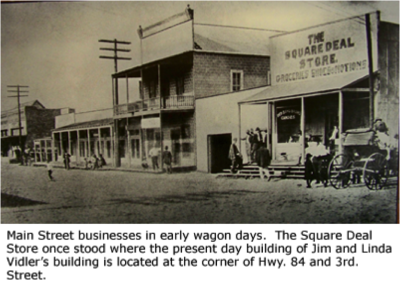 Before the advent of the automobile and several years thereafter there were two wagon yards and two livery stables located in the downtown section of the town. Almost any night, especially during the cotton season, the wagon yards were well filled with campers who usually carried their own feed for their live-stock, and often for themselves. A sawmill covered several blocks in the southern part of the town. This mill was operated until about 1900. They secured their logs by water and tram-road. There were some 15 or 20 miles of railroad north of town. This tram crossed the Southern Pacific Railroad about Seventh Street. There has never been a time since the town was incorporated that it did not have one or more sawmills operating in or near Logansport. 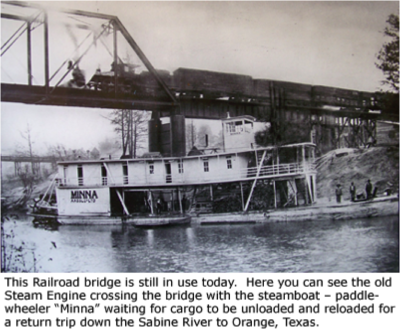 Between the time the railroad reached Logansport and the late 90’s, steamboats operated on the Sabine River traveling back and forth from here to Orange, Texas. The two largest boats, The Neches Belle and the “Extra” brought cargoes of cotton, mostly for shipment to Shreveport and some Texas points. Each of these boats on their down river trip carried various commodities for distribution along the boat landings on the river. Several other small boats hauled cotton and staves—mostly staves (stakes), which were exported to European countries. After the KCP&G (now KCS) Railroad was built on the Louisiana side, and the Santa Fe on the Texas side of the river, the steamboats found it no longer profitable to operate. The remains of “The Neches Belle”, “The Extra”, and the “Maud Howell” are resting on the river bottom at Logansport. The entire business section of Logansport was destroyed by fire in 1898, including the railroad station and the Masonic Hall. The Masonic Hall was the oldest building in the town and had long served as the town’s semi-public building. The lower floor served as a school room, for church services of various denominations, and other public gatherings. Most of the business section was again destroyed about two years later, only two or three brick and sheet iron buildings withstood the fire. After this fire the town council passed an ordinance restricting the building of anything other than brick or sheet iron buildings in the downtown area. At the time of these fires the town had no water system of its own, and the only fire protection came from a four inch line that ran down Second Street from the water tank of the Chicago Lumber & Coal Co. ending at Main Street. From 1885 until mid-century cotton and timber were the chief sources of income for the farmers in the Logansport trade area. For a very long time two cotton gins were in operation in the town, and numerous others were located near by. During the year August 1st, 1913, to August 1st, 1914, a total of 5,066 bales of uncompressed cotton were shipped from the town by rail. Shipments decreased gradually each year until not a single bale was shipped by rail during the last cotton season in 1962. The cotton gins are now idle and most have been torn down. In 1932, some of the business men of the town, in connection with the Southern Pacific R.R., under-wrote the financing of about 30 farmers to plant one acre each in tomatoes. The weather was not very favorable and the crop was short. There was not enough tonnage for buyers to establish packing sheds here and about 9 carloads were trucked to nearby towns where packing sheds were operating. The next year the crop was better and each year thereafter, until 1950 one to three packing sheds operated here, shipping a total of 923 refrigerator carloads, an average of 51 carloads per year. Cotton and tomatoes were replaced as a source of revenue for the local citizens and farmers by cattle and forestry products. Many locals worked in the chicken processing industry, logging industry and at the plywood facility plant. The poultry and plywood plants are now closed. Oil and gas was also a very important source of income to the early citizens of Logansport. One of the early gas wells in the Town of Logansport supplied all of the gas used by the Town. Now, the Town of Logansport and its residents are once again receiving monies from the Oil and Gas industry. With the discovery of the Haynesville Shale and Bossier Shale in DeSoto Parish, new businesses are being established in Logansport and the surrounding communities to support ongoing drilling efforts, pipeline construction, and transportation/production of natural gas and oil resources. Logansport has turned one of its most available resources, water, into an important source of income for the Town, by marketing its water to the oil and gas industry and by processing waste water from the Oil and Gas industry.